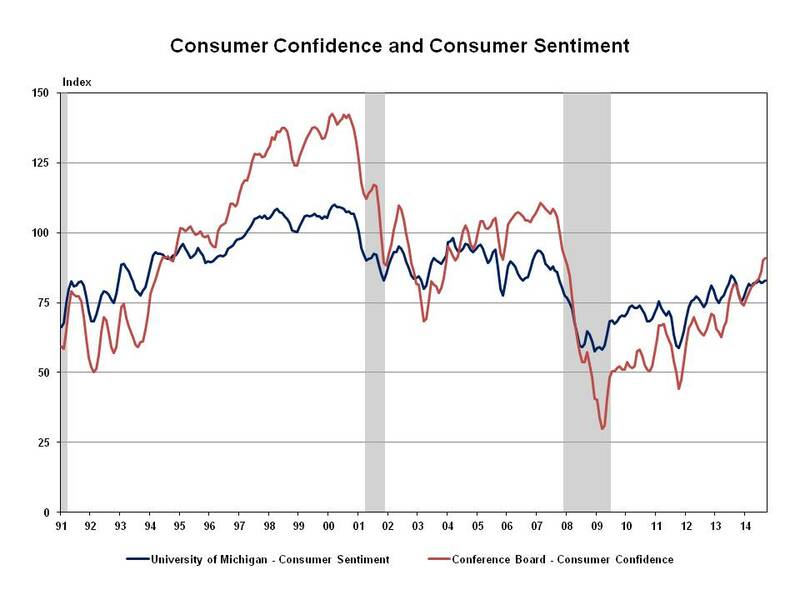 Spurred by improved consumer expectations, the Thomson Reuters/University of Michigan Consumer Sentiment Index reached its highest level since July 2007, and the Conference Board Consumer Confidence Index increased sharply. This 3-month moving average charts both surveys. The Consumer Sentiment Index increased to 86.9 in October from 84.6 the previous month. The survey’s measure of consumer expectations increased to 79.6 in October from 75.4 in September. The Consumer Confidence Index increased to 94.5 in October from 89.0 in September. The survey’s Expectations Index increased to 95.0 in October from 86.4 in September.